We are pleased to announce the winners of the Run & Hug family edition contest, sponsored by Archives.com and Whitepages.com. The contest called for the public to vote on submissions of photos and stories about a long-lost relative to win an all-expense paid trip for two to reunite with that relative, along with $1,000 cash. 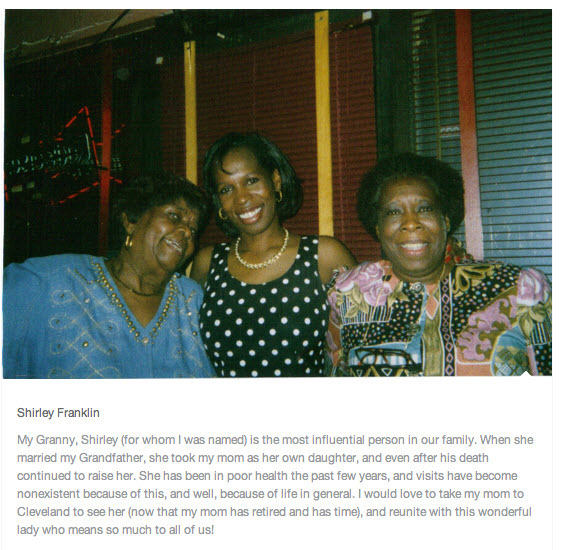 Shirley Franklin, a homemaker in Lexington, OK, garnered 16,324 votes to win a trip to visit her grandmother in Cleveland. She plans to take her mother, a recently retired nurse who lives in Norman, OK, with her on the visit in April. "It really is a dream come true," Franklin wrote in an email to Archives.com after the results were announced. "My Granny is one of the biggest influences in my life, and though I talk to her very regularly, I haven't seen her in a few years." The distance between them and her grandmother's poor health in recent years have made visits impossible. When Franklin heard she won the Run & Hug contest, she screamed. Then she called her mom. "When I told my mom over the phone, she was silent," Franklin wrote. "My mother is NEVER silent. She's always laughing, and chatting, so I thought I had lost the connection. I said, 'Mom?' and she was there. I think I stunned her for a moment. She talks to her mom every day, so she was especially thrilled that I won the prize. I didn't even get a chance to tell Granny. Mom let me off the phone to call her first!" Franklin is planning the trip for early April to coincide with her mom's birthday. They plan to use some of the prize money to go shopping together in Cleveland. Franklin said she also plans to treat her children's choir at church to a pizza party. The runner-up received $500 and the second runner-up received $200. All of the top ten contestants received one-year subscriptions to Archives.com. You can view the top entries at runandhug.com and see the winning entry below.